Limit daily consumption of saturated fats (found in red meat, butter, cheese and whole-fat dairy products) to a range of 5% to 6% of total daily calories. Replace unhealthy saturated and trans fats with healthy unsaturated fats from plant and fish oils. Olive and canola oils are rich in monounsaturated fats. Salmon and other fatty fish, as well as walnuts and other nuts, are excellent sources of polyunsaturated fats. Restrict your sodium (salt) intake to avoid exceeding the recommended daily values. Reducing sodium is especially important for middle-aged and older people, African-Americans, and people with high blood pressure. The DASH diet is a good example of a heart-healthy eating plan that limits sodium intake to less than 2.3 grams a day. If you drink alcohol, do so in moderation (no more than 1 drink per day for women, 2 drinks per day for men). Exercise regularly and include at least 40 minutes of moderate-to-vigorous exercise 3 to 4 times a week so that you burn at least as many calories as you consume to attain or maintain a healthy weight. This can help lower blood pressure and cholesterol levels. Have your health care provider create an individualized weight loss plan for you if you are overweight or obese. The plan should include a reduced calorie diet, behavioral strategies, and increased physical activity. Dietary guidelines from the U.S. Departments of Agriculture and Health and Human Services, released in late 2015, follow similar recommendations for limiting sugars, saturated fat, and sodium (salt). Restrictions on dietary cholesterol have been removed, since saturated fat is a larger concern for heart health than the amount of cholesterol found in food sources. There is little evidence that multivitamin supplements help reduce the risk for heart disease or cancer, according to recommendations from the United States Preventive Services Task Force. The agency specifically recommends against taking vitamin E or beta carotene supplements because there is conclusive evidence that they do not help prevent disease. Nutrient-rich foods (especially vegetables and fruits) are the best source for your vitamins. The foods you consume, along with regular exercise, can help achieve these goals. Macronutrients are the major components of food. Fat, carbohydrates, and protein are macronutrients. Micronutrients include vitamins and minerals. They are required by the body only in small amounts. Avoid or limit foods that are high in calories but contain few nutrients. These empty calorie foods are high in unhealthy saturated fats, added sugars, and sodium (salt) and provide little nutritional benefit. Balance calorie intake and physical activity to achieve or maintain a healthy body weight. (Controlling weight, quitting smoking, and exercising regularly are essential companions of any diet program. Try to get at least 40 minutes of moderate-intensity exercise on 3 to 4 or more days per week. Eat a diet rich in a variety of vegetables and fruits. Vegetables and fruits that are deeply colored (such as spinach, carrots, peaches, and berries) are especially recommended as they have the highest micronutrient content. Include fish, poultry, fat-free or low-fat dairy products, legumes, and nuts. Eat at least twice a week oily fish, such as salmon, trout, herring, mackerel, and sardines, which are rich in heart-protective omega-3 fatty acids. Limit intake of red meat. Grill, bake, or broil (do not fry!) using nontropical vegetable oils, such as olive or canola oil. Limit daily intake of saturated fat (found mostly in animal products) to a range of 5% to 6% of total calories. Avoid trans fats (found in partially-hydrogenated fats and oils, commercially baked products, and many fast foods). The USDA has a less stringent recommendation of less than 10% calories from saturated fats. Use little or no salt in your foods. Reduce or avoid processed foods that are high in sodium (salt). Reducing salt can lower blood pressure and decrease the risk of heart disease and heart failure. The American Heart Association recommends a reduction of sodium intake to <2300 mg/day (to be consistent with the USDA Dietary Guidelines for Americans) or further reduction to 1500 mg/day as needed for enhanced BP lowering. Limit beverages and foods that contain added sugars (corn syrups, sucrose, glucose, fructose, maltose, dextrose, concentrated fruit juice, honey). If you consume alcohol, do so in moderation. The AHA recommends limiting alcohol to no more than 2 drinks per day for men and 1 drink per day for women. 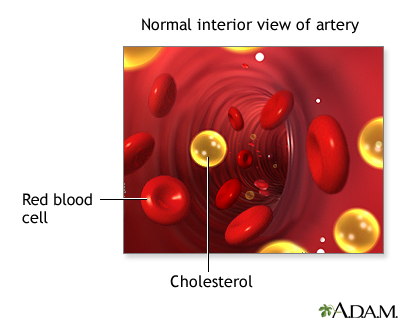 Cholesterol is a soft, waxy substance that is present in all animal cells and in animal-based foods (not in plants). Unhealthy cholesterol levels (low HDL, high LDL, and high triglycerides) increase the risk for heart disease and heart attack. Some risk factors for cholesterol can be controlled (such as diet, exercise, and weight) while others cannot (such as age, gender, and family history). Dietary cholesterol is found in all animal-based foods and is especially high in meat, eggs, and shellfish. However, saturated fat has a much greater impact on cholesterol levels than dietary cholesterol. Although egg yolks contain cholesterol, up to 2 eggs (whole eggs) per day can be healthful for most people and are a good source of protein, iron, and B vitamins. The 2015 Dietary Guidelines for Americans removes limits on dietary cholesterol. Saturated fats are the main contributor to unhealthy cholesterol levels and heart disease. Saturated fats are found predominantly in animal products (such as red meat and dairy products) and tropical oils (such as palm, palm kernel, coconut, and cocoa butter). For protection against heart disease, it is important to limit the amount of saturated fat consumed. Plant foods, such as fruits, vegetables, nuts, and grains, do not contain cholesterol or saturated fat. Plant substances known as sterols, and their derivatives called stanols, may reduce cholesterol by blocking its absorption in the intestinal tract. Margarines containing sterols are available. High blood pressure, also called hypertension, is elevated pressure of the blood in the arteries. High blood pressure makes the heart work harder, which over time can lead to damage in blood vessels and organs throughout the body. Uncontrolled high blood pressure significantly increases the risk for heart attack and stroke, as well as affects the kidneys, eyes, and sexual function. Blood pressure is measured in millimeters of mercury (mm Hg). The higher number is the systolic blood pressure, the pressure in your arteries while your heart is pumping blood. The lower number is the diastolic blood pressure, the pressure when your heart is relaxing and refilling with blood between beats. Normal blood pressure readings are below 120/80 mm Hg. High blood pressure (hypertension) is generally considered to be a blood pressure reading greater than or equal to 140 mm Hg (systolic) or greater than or equal to 90 mm Hg (diastolic). Blood pressure readings in the prehypertension category (120 to 139 systolic or 80 to 89 diastolic) indicate an increased risk for developing hypertension. Sodium is the critical factor in controlling high blood pressure. People with high blood pressure need to make sure to limit the amount of sodium they consume. 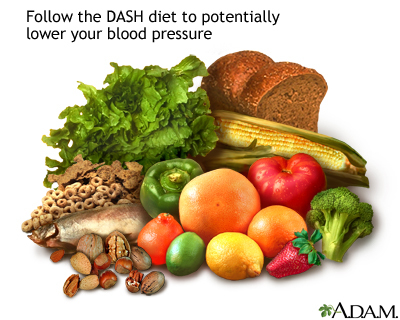 The DASH (Dietary Approaches to Stop Hypertension) diet is an eating plan proven to improve blood pressure. This diet emphasizes whole grains, fruits, vegetables and restricts sodium intake to no more than 1,500 mg/day for people with high blood pressure. It also encourages foods rich in potassium and fiber, which are important for blood pressure control. Some fat is essential for normal body function. Fats can have good or bad effects on health, depending on their chemistry. When it comes to reducing heart disease risk, the type of fat may be more important than the total amount of fat. Monounsaturated fatty acids (MUFA) and polyunsaturated fatty acids (PUFA) are "good" fats that help promote heart health. MUFAs and PUFAs should be the main type of fats consumed. Olive oil is rich in MUFAs. Salmon and walnuts are good sources of PUFAs. Saturated fats and trans fats (trans fatty acids) are "bad" fats that can contribute to heart disease, and should be avoided or limited. All fats, good or bad, are high in calories compared to proteins and carbohydrates. One fat gram provides 9 calories versus the 4 calories provided by 1 gram of protein or carbohydrate. Monounsaturated fatty acids (found in olive oil, canola oil, peanut oil, nuts, and avocados) and omega-3 polyunsaturated fatty acids (found in oily fish, canola oil, flaxseed, and walnuts) should be the first choice for fats. Limit saturated fat to less than 6% of total daily calories. Saturated fats are found predominantly in animal products (meat, whole-fat dairy) as well as tropical oils (coconut, palm). USDA dietary guidelines limit saturated fats to less than 10% total daily calories. Limit trans fats (found in stick margarine, commercial baked goods, snack and fried foods) to a minimum. Click the icon to see an image of saturated fats. Click the icon to see an image of trans fatty acids. Try to replace saturated fats and trans fatty acids with unsaturated fats from plant and fish oils. Do not replace fats with refined carbohydrates. Omega-3 fatty acids, which are found in fish and some plant sources, are a good source of unsaturated fats. Fish oils contain the omega-3 fatty acids docosahexaenoic (DHA) and eicosapentaenoic (EPA) acids, which have significant benefits for the heart. The American Heart Association recommends eating fatty fish such as salmon at least twice a week to gain a healthful amount of these omega-3 fatty acids. Although eating fish appears to protect the heart, the effect of fish oil supplements is unclear. Some studies suggest these supplements are heart protective, but other studies indicate that omega-3 fatty acid supplements have minimal benefit. Click the icon to see an image of omega-3 fatty acids. Carbohydrates are either complex (as in starches) or simple (as in sugars). One gram of carbohydrates provides 4 calories. Try to get your carbohydrates from complex sources such as vegetables, fruits, and whole grains. Many studies report that people can protect their heart and circulation by eating plenty of fruits and vegetables. Complex carbohydrates found in whole grains and vegetables are much healthier than those found in starch-heavy refined carbohydrate foods, such as white-flour pastas and white potatoes. Most complex carbohydrates are high in fiber, which is important for health. Click the icon to see an image of complex carbohydrates. Dietary fiber is an important component of many complex carbohydrates. It is found only in plants. Fiber cannot be digested by humans but passes through the intestines, drawing water with it, and is eliminated as part of feces content. Insoluble fiber (found in wheat bran, whole grains, seeds, nuts, beans, and fruits and vegetables) may help achieve weight loss. Consuming whole grains on a regular basis may lower the risk for heart disease and heart failure, improve factors involved with diabetes, and lower the risk for type 2 diabetes. Whole grains include brown rice, quinoa, bulgur, oatmeal, and whole-wheat bread, High consumption of nuts (such as almonds, macadamia, and walnuts) may be highly heart protective, independent of their fiber content. The American Heart Association recommends that at least half of grains consumed in one day should be whole grains. Soluble fiber (found in dried beans, oat bran, barley, apples, and citrus fruits) may help achieve healthy cholesterol levels and possibly reduce blood pressure as well. Soluble fiber supplements, such as those that contain psyllium or glucomannan, may also be beneficial. Psyllium is taken from the husk of a seed and is effective for lowering total and LDL cholesterol. It is found in laxatives (Metamucil), breakfast cereals, and other products. People who increase intake of soluble fiber should also drink more water to avoid cramps. Click the icon to see an image of soluble and insoluble fiber. Americans eat nearly half a pound (0.23 kg) of sugar a day on average, and sugar intake constitutes 25% of a day's calories. Ideally no more than 10% of daily calories should come from added sugar. Sucrose. Source of most dietary sugar, found in sugar cane, honey, and corn syrup. Sucrose is a disaccharide (a type of molecule formed by two simple sugars) composed of glucose and fructose. Fructose. Naturally occurring sugar found in fruits and vegetables. Although fructose does not appear to be have any different effects in the body than sucrose, most of the fruits and vegetables that contain it are important for good health. However, because fructose can raise triglyceride levels, people with high triglycerides should try to select fruits that are relatively lower in fructose (cantaloupe, grapefruit, strawberries, peaches, and bananas). Fructose is a monosaccharide (simple sugar). A third sugar, lactose, is a naturally occurring sugar found in dairy products including milk, yogurt, and cheese. Lactose is a disaccharide composed of glucose and galactose. Click the icon to see an image of simple carbohydrates. High levels of sugar consumption, fructose or sucrose, are associated with higher triglycerides and lower levels of HDL (good) cholesterol. The high consumption of sugar is contributing to our current obesity epidemic. Soda, other sweetened beverages, and fruit juice are major causes of childhood obesity. The American Heart Association recommends eating nutrient-rich fruits and vegetables instead of sugar-sweetened beverages and food products with added sugars. The focus is on limiting added sugars in foods, not the naturally occurring sugars found in fruits and unsweetened dairy products. The AHA recommends no more than 100 calories (6 teaspoons) for women and 150 calories (9 teaspoons) for men of added sugar per day. Any sugar molecules ending in "ose" (dextrose, fructose, glucose, lactose, maltose, sucrose). Sugar-free. Less than 0.5 grams of sugar per serving. Reduced sugar/Less sugar. At least 25% less sugars per serving compared to traditional standard serving. No added sugars or without added sugars. No sugars or sugar-containing ingredients such as juice or dry fruit is added during processing. Protein is found in animal-based products (meat, poultry, fish, and dairy) as well as vegetable sources such as beans, soy, nuts, and whole grains. Protein is important for strong muscles and bones. The best sources of protein are fish, poultry, low-fat dairy products, beans, and soy. Restrict intake of red meat or any meat that is not lean. Evidence suggests that eating moderate amounts of fish (twice a week) may improve triglyceride and HDL levels and help lower the risks for death from heart disease and stroke. The healthiest fish are oily fish such as salmon, mackerel, trout, sardines, or albacore ("white") tuna, which are high in the omega-3 fatty acids DHA and EPA. Most guidelines recommend eating fish at least twice a week. On average, 3 capsules of fish oil (preferably as supplements of DHA-EPA) are about equivalent to eating one serving of fish. However, studies suggest that fish oil supplements are not as heart protective as dietary sources. Women of childbearing age or nursing mothers should avoid fish that contains high amounts of mercury (such as shark, swordfish, and mackerel) and limit intake of tuna to 6 ounces/week. They should, however, try to eat at least 12 ounces/week of a variety of lower mercury-containing fish and shellfish (such as catfish, salmon, haddock, perch, tilapia, trout, crab, shrimp, and scallops). Saturated fat in meat is the primary danger to the heart. The fat content of meat varies depending on the type and cut. For heart protection, choose lean meat. It is best to eat skinless chicken or turkey. The leanest cuts of pork (loin and tenderloin), veal, and beef are nearly comparable to chicken in calories and fat as well as their effect on LDL and HDL levels. However, in terms of heart health, fish or beans are better choices. The best dairy choices are low-fat or fat-free products. Substituting low-fat dairy products for full-fat dairy products can help to lower saturated fat intake and total calorie intake while still providing protein, vitamins, and minerals. Soy foods are made from soybeans, a legume. Soy is rich in both soluble and insoluble fiber, omega-3 fatty acids (omega-3 fatty acid ALA, not the DHA/EPA found in fatty fish), and provides a high protein, low carbohydrate content. The best sources of soy protein are soy products (soybeans, tempeh, tofu, soy flour, and soy milk). Soy sauce is not a good source of soy protein. It contains only a trace amount of soy and is very high in sodium. For many years, soy was promoted as a food that could help lower cholesterol and improve heart disease risk factors. However, it appears that soy protein and isoflavone supplement pills do not have a major effect on cholesterol or heart disease prevention. The American Heart Association still encourages people to include soy foods as part of an overall heart healthy diet but does not recommend using isoflavone supplements. It recommends replacing foods high in animal fats with those containing soy protein. Antioxidants are chemicals that act as scavengers of particles known as oxygen-free radicals (also sometimes called oxidants). Vitamins E and C have been studied for their health effects because they serve as antioxidants. High intake of foods rich in these vitamins (as well as other food chemicals) are associated with many health benefits, including prevention of heart problems. However, despite much research, there is little evidence that regular use of multivitamin supplements reduces the risk for heart disease. Supplements of vitamin E, vitamin C, and beta-carotene are not recommended as part of a heart-healthy diet. Food rich in these nutrients is recommended. A multivitamin may be recommended in certain specific circumstances for individuals with increased nutritional needs such as people who have had weight loss surgeries or women who are trying to get pregnant. Deficiencies in the B vitamins folate (known also as folic acid or vitamin B9), B6, and B12 have been associated with a higher risk for heart disease in some studies. Such deficiencies produce higher blood levels of homocysteine, an amino acid that has been associated with a higher risk for heart disease, stroke, and heart failure. While major studies have indicated that B vitamin supplements help lower homocysteine levels, they do not protect against heart disease, stroke, or dementia (memory loss). Homocysteine may be a marker for heart disease rather than a cause of it. Click the icon to see an image of vitamin B9 sources. Click the icon to see an image of vitamin B12 sources. Vitamin D, in addition to promoting bone health, may also be important for heart health. In studies, people who were vitamin D deficient appeared to have an increased risk for heart-related deaths. Other studies have suggested that children and adolescents who have low blood levels of vitamin D may be at increased risk of developing heart disease and diabetes. More research is needed. Dietary sources of vitamin D include fatty fish (such as salmon, mackerel, and tuna), egg yolks, liver, and vitamin D-fortified milk, orange juice, or cereals. Sunlight is also an important source of vitamin D. However, many Americans do not get enough vitamin D solely from diet or exposure to sunlight and may require supplements. 0-12 months: 400 IU per day. 1 to 70 years: 600 IU per day. 70 years and older: 800 IU per day. Potassium supplements should not be taken without first checking with your provider. For people who take potassium-sparing diuretics (such as spironolactone), or have chronic kidney problems, potassium supplements may be very dangerous. Some studies suggest that magnesium supplements may cause small but significant reductions in blood pressure. The recommended daily allowance of magnesium is 320 mg. People who live in soft water areas, who use diuretics, or who have other risk factors for magnesium loss may require more dietary magnesium than others. Calcium regulates the tone of the smooth muscles lining blood vessels. Studies have found that people who consume enough adequate dietary calcium on a daily basis have lower blood pressure than those who do not. Consuming too much dietary calcium may, however, have a negative effect. Dairy products are the main dietary source of calcium. Other foods that are rich in calcium include collard greens, sardines canned with bones, and fortified almond, rice, or soy milks. Click the icon to see an image of calcium sources. Some sodium (salt) is necessary for health, but the amount is vastly lower than that found in the average American diet. High salt intake is associated with high blood pressure (hypertension). Limiting sodium can help lower blood pressure and may also help protect against heart failure and heart disease. The American Heart Association recommends reduction of sodium intake to <2300 mg/day (to be consistent with the USDA Dietary Guidelines for Americans) or further reduction to 1500 mg/day as needed for enhanced BP lowering. Some people (especially African-Americans, older adults, people with diabetes, and people with a family history of hypertension) are "salt sensitive," which means their blood pressure increases in response to sodium more than other people's. People with salt sensitivity have a higher than average risks of developing high blood pressure as well as other heart problems. Sodium restriction is particularly important for people with salt sensitivity, as well as those with diagnosed hypertension. Simply eliminating the use of salt at the table eating can help. But it is also important to reduce or avoid processed and prepared foods that are high in sodium. Spices can be used in place of salt to enhance flavor. Salt substitutes, such as Nu-Salt and Mrs. Dash (which contain mixtures of potassium, sodium, and magnesium), are available, but they can be risky for people with kidney disease or those who take blood pressure medication that causes potassium retention. For people without risks for potassium excess, adding potassium-rich foods to a diet can help. Look for foods that are labeled "low-sodium," "sodium-free," "no salt added," or "unsalted." Check the total sodium content on food labels. Be especially careful of canned, packaged, and frozen foods. A Registered Dietician-Nutritionist can teach you how to understand these labels. Frozen and fresh vegetables are preferable to canned as they are usually lower in sodium (unless they are seasoned or served in a sauce most frozen vegetables have no added sodium and are comparable to fresh). Do not cook with salt and do not add salt to your food. Try pepper, garlic, lemon, or other spices for flavor instead. Be careful of packaged spice blends as these often contain salt or salt products (like monosodium glutamate, or MSG). Avoid processed meats (particularly cured meats, bacon, hot dogs, sausage, bologna, ham, and salami). Processed meats have been associated with increased risk for heart disease, type 2 diabetes, and certain types of cancer. Avoid foods that are naturally high in sodium, like anchovies, nuts, olives, pickles, sauerkraut, soy and Worcestershire sauces, tomato and other vegetable juices, and cheese. Take care when eating out. Stick to steamed, grilled, baked, boiled, and broiled foods with no added salt, sauce, or cheese. Use oil and vinegar, rather than bottled dressings, on salads. Eat fresh fruit or sorbet when having dessert. People with certain medical conditions, (such as heart failure), that cause fluid retention may need to restrict their intake of water and other fluids. A number of studies have found heart protection from moderate alcohol intake (one or two glasses a day). Although red wine is most often cited for healthful properties, any type of alcoholic beverage appears to have similar benefit. However, alcohol abuse can increase the risk of high blood pressure and many other serious problems. Men should limit their intake to no more than 2 drinks a day, and women (especially those at risk for breast cancer) and thinner people should have no more than 1 drink a day. A standard drink contains around 14 grams of pure alcohol and is equivalent to a 12-ounce (350 milliliter) bottle of regular beer (5% alcohol), a 5-ounce (150 milliliter) glass of table wine (12% alcohol), or a 1.5-ounce (44 milliliter) shot of hard liquor (40% alcohol). Overuse of alcohol can lead to many heart problems. People with high triglyceride levels should drink sparingly if at all because even small amounts of alcohol can significantly increase blood triglycerides. Pregnant women, people who can't drink moderately, and people with liver disease should not drink at all. People who are watching their weight should be aware that alcoholic beverages are high in calories. Coffee drinking is associated with small increases in blood pressure, but the risk it poses is very small in people with normal blood pressure. Moderate coffee consumption (3 to 5 cups a day, or the equivalent of 400 mg of caffeine per day) poses no heart risks and long-term coffee consumption does not appear to increase the risk for heart disease in most people. Although both black and green tea contain caffeine, they are safe for the heart. Tea contains chemicals called flavonoids that may be heart protective. There are many dietary approaches for protecting heart health, such as the Mediterranean Diet, which emphasizes fruits, vegetables, and healthy types of fats. The DASH diet is very effective for people with high blood pressure and others who need to restrict sodium (salt) intake. Other heart-healthy diet plans include the American Heart Association diet and the USDA Food Pattern. Try to focus on eating a balanced meal full of nutrient-rich foods. Vegetables and fruits provide the most nutrients and fiber, and the fewest calories. Whole grain foods (oats, bulgur, barley, brown rice) are also rich in fiber and vitamins. The Mediterranean diet is rich in heart-healthy fiber and nutrients, including omega-3 fatty acids and antioxidants. The diet focuses on fruits, vegetables, and unsaturated "good" fats, particularly olive oil. Olive oil contains monounsaturated fatty acids (MUFAs) and also contains polyphenols, which are phytochemicals (plant chemicals) that contain antioxidant properties. Virgin olive oil comes from a simple pressing of the fruit. Extra-virgin olive oil is a superior tasting form of virgin olive oil. Non-virgin olive oils are produced using chemical processes. For health purposes, it is best to use extra-virgin or virgin olive oil. Drink 1 or 2 glasses of wine each day if alcohol is enjoyable and there are no reasons to restrict its use. Limit whole fat dairy products. Eat moderate amounts of fish and poultry. Fish is the diet's main protein source. Eat plenty of fresh fruits and vegetables, nuts, legumes, beans, and whole grains. Season foods with garlic, onions, and herbs. Use extra-virgin or virgin olive oil. Older adults who combine a Mediterranean diet with healthy lifestyle habits have been found to live longer lives. Many studies confirm that the Mediterranean diet is as good as or better than a low-fat diet for preventing heart attack, stroke, or other heart events. The salt-restrictive DASH diet (Dietary Approaches to Stop Hypertension) is proven to help lower blood pressure, and may have additional benefits for preventing heart disease, stroke, and heart failure. Effects on blood pressure are sometimes seen within a few weeks. This diet is rich in important nutrients and fiber. It also provides far more potassium (4,700 mg/day), calcium (1,250 mg/day), and magnesium (500 mg/day), but much less sodium, than the average American diet. A diet that is effective in lowering blood pressure is called Dietary Approaches to Stop Hypertension (DASH). Limit sodium (salt) intake to no more than 2,300 mg a day. In adults with prehypertension and hypertension limit sodium intake to no more than 1,500 mg. When choosing fats, select monounsaturated oils, such as olive or canola oils. Choose whole grains over white flour or pasta products. Choose fresh fruits and vegetables every day. Many of these foods are rich in potassium, fiber, or both, which may help lower blood pressure. Include nuts, seeds, or legumes (dried beans or peas) daily. Choose modest amounts of protein (no more than 18% of total daily calories). Fish, skinless poultry, and soy products are the best protein sources. Try to get at least 30 g of daily fiber. Low carbohydrate diets generally restrict the amount of carbohydrates but do not restrict protein sources. The Atkins diet restricts complex carbohydrates in vegetables and, particularly, fruits that are known to protect against heart disease. The Atkins diet also can cause excessive calcium excretion in urine, which increases the risk for kidney stones and osteoporosis. This diet is a weight loss program and not meant for long term health maintenance. Low-carbohydrates diets, such as South Beach, The Zone, and Sugar Busters, rely on a concept called the "glycemic index," or GI, which ranks foods by how fast and how high they cause blood sugar levels to rise. Foods on the lowest end of the index, such as whole grains, fruits, beans, and non-starchy vegetables, take longer to digest may stabilize insulin levels. Foods high on the glycemic index include white bread, white potatoes, and pasta. However, some research suggests that glycemic index may not have much impact on heart health. According to the Academy of Nutrition and Dietetics, low GI diets are not recommended for weight loss or weight maintenance since they have not been proven to be effective. Some people do find that low-carbohydrate diets help with weight loss in the short term. But there has been debate about whether Atkins and other low-carbohydrate diets can increase the risk for heart disease, as people who follow these diets tend to eat more animal-saturated fat and protein and less fruits and vegetables. In general, these diets appear to lower triglyceride levels and raise HDL (good cholesterol) levels. Total cholesterol and LDL (bad cholesterol) levels tend to remain stable or possibly increase somewhat. Large studies have not found an increased risk for heart disease, at least in the short term. In fact, some studies indicate that these diets may help lower blood pressure most likely from weight loss. Long-term safety and other possible health effects are still a concern, especially when these diets restrict healthy foods such as fruit, vegetables, and grains while not restricting saturated fats. Low-fat diets that are high in fiber, whole grains, legumes, and fresh produce may offer health advantages in addition to their effects on cholesterol, including helping maintain a healthy weight. However, very restrictive diets such as the Ornish program can be so difficult to maintain that most people have difficulty staying with them. Very low-fat diets may also reduce calcium absorption, and absorption of the fat-soluble vitamins D,K,A, and E. Many people who reduce their fat intake do not consume enough of the basic nutrients, including vitamins A, D, E, calcium, iron, and zinc. People on low-fat diets should eat a wide variety of foods and take a multivitamin if appropriate. Calorie restriction is the cornerstone of weight-loss programs. Restricting calories also appears to have beneficial effects on cholesterol levels, including reducing LDL and triglycerides and increasing HDL levels. A 5% to 10% decrease in body weight can result in a 20% decrease in triglyceride levels. In general, reducing calories while increasing physical activity is still the best method for maintaining weight loss and preventing serious conditions, such as diabetes and heart disease. As a rough rule of thumb, 1 pound (0.45 kg) of fat contains about 3,500 calories, so one could theoretically lose a pound (0.45 kg) a week by reducing daily caloric intake by about 500 calories a day. However, caloric restrictions and metabolic needs vary by person and need to be individually calculated. A Registered Dietitian can help you determine how many calories per day you need in order to lose weight. A healthy weight is very important for healthy cholesterol levels. For people who are overweight or obese, losing even a modest amount of weight has significant health benefits, even if an ideal weight is not achieved. There is a direct relationship between the amount of weight lost and an improvement in cholesterol. In particular, triglycerides are closely linked to weight: a sustained 3% to 5% weight loss can significantly reduce unhealthy triglyceride levels. Even greater amounts of weight loss can help improve LDL (bad cholesterol) and HDL (good cholesterol) levels. Weight loss also helps reduce the need for blood pressure medication, improve blood glucose (sugar) levels, and lower the risk for developing type 2 diabetes. Obesity is now considered and treated as a disease, not a lifestyle issue. The medical community's understanding of weight issues has evolved. Scientific evidence shows that weight gain is a complex process, and weight loss involves more than simple will power. It is clear that excess weight contributes to many health problems, including increased risks for cardiovascular disease conditions. Your provider should check your body mass index (BMI) at least once a year. You can also check your BMI online at -- www.cdc.gov/healthyweight/assessing/bmi/adult_bmi/english_bmi_calculator/bmi_calculator.html. Reduced calorie diet. Your provider should help you select an eating plan that will cut calories and perhaps restrict certain food types (such as fats or carbohydrates). Your provider may make specific recommendations depending on your cholesterol profile and other factors. For example, a low-calorie, low-fat diet can be very effective for reducing LDL levels. (Your personal and cultural food preferences should also be considered.) Your provider may refer you to a registered dietician or nutritionist for counseling. Behavioral Strategies. You need to consider how to set weight loss goals, monitor weight, track food and calorie intake, change shopping habits and food storage environments, and establish fitness routines. People may benefit from individual, group, or telephone counseling sessions. Increased Physical Activity. Aim for at least 30 minutes of moderate to vigorous physical activity most if not all days of the week. A weight loss of 5% to 10% within the first 6 months of starting these changes can help improve cholesterol levels and other health indicators. If you have risk factors for heart disease or diabetes and do not achieve weight loss from diet and lifestyle changes alone, your provider may recommend adding a prescription medication to your weight loss plan. For people who have a very high BMI with several cardiovascular risk factors (such as diabetes and high blood pressure) and who are unable to lose weight, bariatric surgery may be considered. Start with realistic goals. When overweight people achieve even modest weight loss they reduce risk factors in the heart. A regular exercise program is essential for maintaining weight loss. If there are no health prohibitions, choose one that is enjoyable. Check with your provider about any health consideration. Do not take hunger pangs as cues to eat. A stomach that has been stretched by large meals will continue to signal hunger for large amounts of food until its size reduces over time with smaller meals. Be honest about how much you eat, and track calories carefully. Carefully noting everything you eat can help you to avoid taking in excessive calories. Once a person has lost weight, maintenance is required. To maintain a healthy weight, make careful decisions about how many calories you consume in food and how many calories you expend through physical activity. Such thinking will eventually become automatic. Even repeated failure to lose weight is no reason to give up. Inactivity is a major risk factor for coronary artery disease, on par with smoking, unhealthy cholesterol, and high blood pressure. In fact, studies suggest that people who change their diet in order to control cholesterol lower their risk for heart disease only when they also follow a regular aerobic exercise program. Exercise also helps improve blood pressure and blood sugar (glucose) levels. The American Heart Association's current guidelines recommend regular physical activity: at least 30 minutes of moderate intensity exercise at least 5 days of the week, or at least 25 minutes of vigorous exercise at least 3 times a week. Moderate to high intensity muscle strengthening activity is also recommended at least 2 days per week. People who maintain an active lifestyle have a significantly lower risk of developing heart disease than do sedentary people. Even moderate exercise reduces the risk of heart attack. People who lose weight and exercise regularly have a much better chance of maintaining weight loss compared to those who do not exercise. Burning at least 250 calories a day (the equivalent of about 45 minutes of brisk walking or 25 minutes of jogging) appears to offer the greatest protection against coronary artery disease, particularly by raising HDL (good cholesterol) levels. Aerobic exercise may help open up blood vessels and, in combination with a healthy diet, may improve blood-clotting factors. Resistance (weight) training offers a complementary benefit by reducing LDL (bad cholesterol) levels. Al-Khudairy L, Hartley L, Clar C, Flowers N, Hooper L, Rees K. Omega 6 fatty acids for the primary prevention of cardiovascular disease. Cochrane Database Syst Rev. 2015;(11):CD011094. PMID: 26571451 www.ncbi.nlm.nih.gov/pubmed/26571451. Aune D, Keum N, Giovannucci E, et al. Whole grain consumption and risk of cardiovascular disease, cancer, and all cause and cause specific mortality: systematic review and dose-response meta-analysis of prospective studies. BMJ. 2016;353:i2716. PMID: 27301975 www.ncbi.nlm.nih.gov/pubmed/27301975. Bazzano LA, Hu T, Reynolds K, et al. Effects of low-carbohydrate and low-fat diets: a randomized trial. Ann Intern Med. 2014;161(5):309-318. PMID: 25178568 www.ncbi.nlm.nih.gov/pubmed/25178568. Eckel RH, Jakicic JM, Ard JD, et al. 2013 AHA/ACC guideline on lifestyle management to reduce cardiovascular risk: a report of the American College of Cardiology/American Heart Association Task Force on practice guidelines. J Am Coll Cardiol. 2014;129(25 Suppl 2):S76-S99. PMID: 24222015 www.ncbi.nlm.nih.gov/pubmed/24222015. Grey A, Bolland M. Clinical trial evidence and use of fish oil supplements. JAMA Intern Med. 2014;174(3):460-462. PMID: 24352849 www.ncbi.nlm.nih.gov/pubmed/24352849. Hartley L, May MD, Loveman E, Colquitt JL, Rees K. Dietary fibre for the primary prevention of cardiovascular disease. Cochrane Database Syst Rev. 2016;(1):CD011472. PMID: 26758499 www.ncbi.nlm.nih.gov/pubmed/26758499. Hooper L, Martin N, Abdelhamid A, Davey Smith G. Reduction in saturated fat intake for cardiovascular disease. Cochrane Database Syst Rev. 2015;(6):CD011737. PMID: 26068959 www.ncbi.nlm.nih.gov/pubmed/26068959. Jensen MD, Ryan DH, Apovian CM, et al. 2013 AHA/ACC/TOS guideline for the management of overweight and obesity in adults: A report of the American College of Cardiology/American Heart Association Task Force on practice guidelines and the obesity society. J Am Coll Cardiol. 2014;63(25 Pt B):2985-3023. PMID: 24239920 www.ncbi.nlm.nih.gov/pubmed/24239920. Micha R, Peñalvo JL, Cudhea F, Imamura F, Rehm CD, Mozaffarian D. Association between dietary factors and mortality from heart disease, stroke, and type 2 diabetes in the United States. JAMA. 2017;317(9):912-924. PMID: 28267855 www.ncbi.nlm.nih.gov/pubmed/28267855. Michaëlsson K, Melhus H, Warensjö Lemming E, Wolk A, Byberg L. Long term calcium intake and rates of all cause and cardiovascular mortality: community based prospective longitudinal cohort study. BMJ. 2013;346:f228. PMID: 23403980 www.ncbi.nlm.nih.gov/pubmed/23403980. Miller M, Stone NJ, Ballantyne C, et al. Triglycerides and cardiovascular disease: a scientific statement from the American Heart Association. Circulation. 2011;123(20):2292-2333. PMID: 21502576 www.ncbi.nlm.nih.gov/pubmed/21502576. Mosca L, Benjamin EJ, Berra K, et al. Effectiveness-based guidelines for the prevention of cardiovascular disease in women -- 2011 update: a guideline from the American Heart Association. Circulation. 2011;123(11):1243-1262. PMID: 21325087 www.ncbi.nlm.nih.gov/pubmed/21325087. Moyer VA; US Preventive Services Task Force. Vitamin, mineral, and multivitamin supplements for the primary prevention of cardiovascular disease and cancer: US preventive services task force recommendation statement. Ann Intern Med. 2014;160(8):558-564. PMID: 24566474 www.ncbi.nlm.nih.gov/pubmed/24566474. Mozaffarian D. Nutrition and cardiovascular and metabolic diseases. In: Mann DL, Douglas PZ, Libby P, Bonow RO, eds. Braunwald's Heart Disease: A Textbook of Cardiovascular Medicine. 10th ed. Philadelphia, PA: Elsevier Saunders; 2015:chap 46. Pan A, Sun Q, Bernstein AM, et al. Red meat consumption and mortality: results from 2 prospective cohort studies. Arch Intern Med. 2012;172(7):555-563. PMID: 22412075 www.ncbi.nlm.nih.gov/pubmed/22412075. Rizos EC, Ntzani EE, Bika E, et al. Association between omega-3 fatty acid supplementation and risk of major cardiovascular disease events: a systematic review and meta-analysis. JAMA. 2012;308(10):1024-1033. PMID: 22968891 www.ncbi.nlm.nih.gov/pubmed/22968891. Rong Y, Chen L, Zhu T, et al. Egg consumption and risk of coronary heart disease and stroke: dose-response meta-analysis of prospective cohort studies. BMJ. 2013;346:e8539. PMID: 23295181 www.ncbi.nlm.nih.gov/pubmed/23295181. Sacks FM, Carey VJ, Anderson CA, et al. Effects of high vs low glycemic index of dietary carbohydrate on cardiovascular disease risk factors and insulin sensitivity: the OmniCarb randomized clinical trial. JAMA. 2014;312(23):2531-2541. PMID: 25514303 www.ncbi.nlm.nih.gov/pubmed/25514303. Sacks FM, Lichtenstein AH, Wu JHY, et al. Dietary fats and cardiovascular disease: A presidential advisory from the American Heart Association. Circulation. 2017;136(3):e1-e23. PMID: 28620111 www.ncbi.nlm.nih.gov/pubmed/28620111. US Department of Health and Human Services; US Department of Agriculture. Dietary Guidelines for Americans 2015-2020. 8th ed. health.gov/dietaryguidelines/2015/resources/2015-2020_Dietary_Guidelines.pdf. Accessed July 28, 2017. US Preventive Task Force. Draft Recommendation Statement Statin. Use for the primary prevention of cardiovascular disease in adults: preventive medication. www.uspreventiveservicestaskforce.org/Page/Document/draft-recommendation-statement175/statin-use-in-adults-preventive-medication1. Updated December 2015. Accessed August 28, 2017. Van Horn L, Carson JA, Appel LJ, et al. Recommended dietary pattern to achieve adherence to the American Heart Association/American College of Cardiology (AHA/ACC) guidelines: a scientific statement from the American Heart Association. Circulation. 2016;134(22:e505-e529. PMID: 27789558 www.ncbi.nlm.nih.gov/pubmed/27789558. Vos MB, Kaar JL, Welsh JA, et al. Added sugars and cardiovascular disease risk in children: A scientific statement from the American Heart Association. Circulation. 2017;135(19):e1017-e1034. PMID: 27550974 www.ncbi.nlm.nih.gov/pubmed/27550974. Whelton PK, Appel LJ, Sacco RL, et al. Sodium, blood pressure, and cardiovascular disease: further evidence supporting the American Heart Association sodium reduction recommendations. Circulation. 2012;126(24):2880-2889. PMID: 24239920 www.ncbi.nlm.nih.gov/pubmed/24239920. Yang Q, Cogswell ME, Flanders WD, et al. Trends in cardiovascular health metrics and associations with all-cause and CVD mortality among US adults. AMA. 2012;307(12):1273-1283. PMID: 22427615 www.ncbi.nlm.nih.gov/pubmed/22427615.